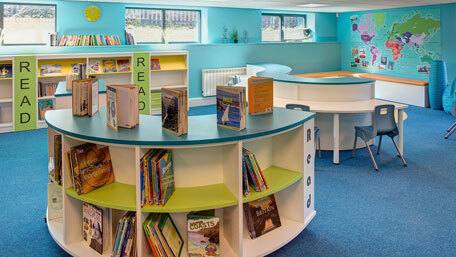 Lidget Green Primary School in Bradford has revitalised an underused area of the school and created a light and airy library for staff and students. The new library has been named ‘The Sithara’, ‘Star’ in Hindi. Demco Interiors worked over a period of weeks with the school team to design and furnish the space with both teams bringing innovative ideas to the table. Mike Pope, headteacher, said: “After seeing a Demco project in another school I was so impressed that I contacted them immediately. Jacquie Smith, one of Demco’s project consultants, visited the school and discussed with us the vision for the library, which she soon turned into a final plan we were delighted with." The new space mixes and matches bespoke and off-the-shelf products. 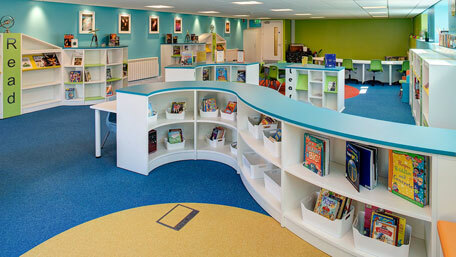 The bespoke curved shelving is designed to create subtle zones and is complemented by island units on castors, similar to the adult version express units often seen and used in public libraries. A green screen for recording is situated at one end, overlooked by amphitheatre-effect soft seating where students can sit for reading time or even to watch some filming. Where possible furnishings have been designed to ‘double up’ with IT desking along the back of shelving and seating areas. The space itself is partly below ground so Demco’s design team installed downlighters and selected colours that bring a really vibrant look and feel to the space. Additional features include banquette seating with concealed storage, and huddles of tables and chairs for group and intervention work. The new library has been named ‘Sithara’, ‘Star’ in Hindi. teams bringing innovative ideas to the table. with us the vision for the library, which she soon turned into a final plan which we were delighted with." bring a really vibrant look and feel to the space. Library design - what do you think? What does it mean to build a library in Iraq?